Welcome to the KBR Farrier Scrap Book. This section is a tribute to some progressive farriers that we know; some who call at the ranch and others who have useful and modern ideas that might not be well known. Click on each image to go a detailed description and learning links. CJF Danny Love is a mainstay when it comes to corrective shoeing. He also provides insights and tips when it comes to hoof care and barefoot trimming. You can link to some of Danny's material by clicking on his picture. 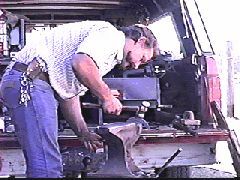 Ron Moritz is a talented farrier who has a natural eye, good skills and a patient way with the younger animals. 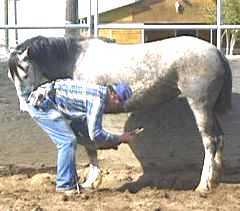 Ron's section takes you to a good feature on teaching young horses to stand for the farrier. Willis is one of Danny's students. Specializing in gentling mustangs, Willis often gives these horses their first trims and is a student of natural wild horse feet. 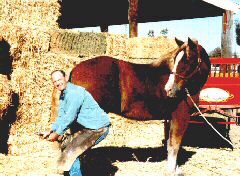 Willis typically trims all of the KBR owned horses, from minis to drafters, and has learned that a proper trim can provide healthy feet for most horses. We will be working up additional farrier profiles.